Serving the Rogue River-Siskiyou National Forest, Josephine County and Jackson County, Umpqua National Forest, Oregon Department of Forestry, and Medford District Bureau of Land Management. Because of the successful suppression of most of the wildfires in the Southwest Oregon area, the Southwest Oregon Joint Information Center blog will no longer be updated and telephones will no longer be answered. This site will be reactivated when necessary. To report a new fire call 911. To everyone in the communities affected by the Southwest Oregon area fires, we extend our gratitude and thanks for your kindness, your acceptance of our work, your tolerance of the smoke generated and your hospitality. Everyone has been warm and gracious to us, the teams assisting, and our firefighters, and it is greatly appreciated. Information for Southwest Oregon Fires is available at the Joint Information Center (JIC) at 541-474-5305 7 AM – 8 PM. Expect temperatures to be cooler with higher humidity throughout the week. This change in weather will be near normal seasonal levels. Light winds will reach up to 10 mph and be out of the north/northwest. 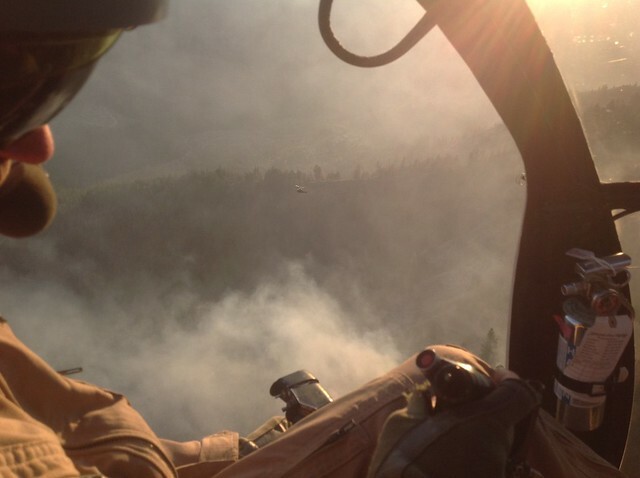 The changing weather conditions may help to moderate fire behavior and help crews during tactical firing operations. There are many area and road closures because of past and present fire activity, see the links below for further information. Fire restrictions are in place. Contact or visit specific land management agencies for the most up to date restrictions. More info about evacuation levels and preparedness can be found at http://www.rvem.org. Josephine County current evacuation information is available at the Josephine County Sheriff’s website at http://www.co.josephine.or.us/News.asp?SectionID=180. Jackson County current evacuation information is available at the Jackson County Sheriff’s website at http://jacksoncountyor.org/sheriff/News. Douglas County current evacuation information is available at the Douglas County Sheriff’s website at http://www.dcso.com/#. Information about fire evacuation levels is also available from the Joint Information Center at 541-474-5305. Evacuees seeking assistance can contact the American Red Cross at (888) 680-1455. These are the most recent closures and will be amended as new information becomes available. The Rogue River-Siskiyou NF Taylor Creek Fire Emergency Area Closure Order 06-10-22-18-62 closes national forest lands near the Taylor Creek Fire for public health and safety. This closure is in effect July 19, 2018 through October 31, 2018, unless sooner rescinded. Detailed information and a map of the area closure are available at https://tinyurl.com/RRSiskiyou. Bear Camp Road is closed to all non-fire traffic as of noon on Tuesday, September 11, 2018. A Forest Closure Order issued by the Rogue River – Siskiyou National Forest describes the closure as: Bear Camp Road (Forest Service and Bureau of Land Management road 23) closed from the intersection at the Merlin-Galice Road (Josephine County Road #2400 and #2401) west to the intersection with Forest Service Road 33 near Agness. Closure orders are in effect on Klamath National Forest and Rogue River-Siskiyou National Forest within the vicinity of the Natchez Fire. A closure order was issued August 5th, effective until the Natchez Fire is declared out. This closure order was expanded as of September 6, 2018 to include more area to the west of the previous closure shown on the map. For details on the closure order please go to the Klamath National Forest Website at www.fs.usda.gov/klamath. -Closure Order No. 18-05-012 is in effect on the Happy Camp/Oak Knoll Rd, Klamath NF. -Closure Order No. 06-10-22-18-61 is in effect on the Wild Rivers Rd, Rogue River - Siskiyou NF. The Rogue River-Siskiyou National Forest Hendrix Fire Area Closure for the southern portion of the Siskiyou Mountains Ranger District remains in effect. Detailed information and a map of the area closure are available at https://www.fs.usda.gov/rogue-siskiyou. An area closure remains in effect for BLM lands southeast of Ashland, Oregon including a portion of the Soda Mountain Wilderness https://tinyurl.com/KlamathonClosure. The Pacific Crest Trail is open in the Soda Mountain Wilderness and Cascade-Siskiyou National Monument, while the Lone Pilot Trail remains closed. A map of the closure is available at http://tinyurl.com/KlamathonClosureMap. Fire has merged with the previously reported Columbus incident and now will be included under Miles. Increase in acreage due to this merge. An Emergency Road and Area Fire Closure has been issued by the Rogue River-Siskiyou National Forest. All portions of the Forest west of Forest Roads 68 near the northern boundary and all of 6640 are closed. This area is bordered on the south by BLM and private land, to the north and west by the Umpqua National Forest and to the east by open portions of the Rogue River- Siskiyou National Forest. When you want to help…. Join or support your local fire department or emergency organizations- they appreciate your generosity since they are the first responders in many cases. Donate to local charitable organizations like the Red Cross. Donate to local food banks, which sometimes get forgotten when fires impact a community. Create and maintain a defensible space around your home! Give emergency responders and yourself a safe area to defend your home in or retreat to, if necessary. Note: Fire camps cannot accept food items due to health and federal contract regulations. We feed our assigned fire crews three meals a day plus snacks. Attention Lodges, Permit Holders, and Residents of Agness/Galice: Today, Tuesday, September 11, 2018, at noon, Bear Camp Road (23 road) will be closed to all non-fire traffic. Firefighters will be conducting tactical firing operations along 23 to remove fuel ahead of the fire. This road will remain closed until it is considered to be safe for public travel. Thanks You for your continued cooperation and patience. Expect temperatures to be cooler with higher humidity throughout the week. This change in weather will be near normal seasonal levels. Winds will be light and out of the west/northwest with clouds clearing in the afternoon. The changing weather conditions may help to moderate fire behavior and prevent smoke from settling in the surrounding area. The Rogue River-Siskiyou NF Taylor Creek Fire Emergency Area Closure Order 06-10-22-1862 closes national forest lands near the Taylor Creek Fire for public health and safety. This closure is in effect July 19, 2018 through October 31, 2018, unless sooner rescinded. Detailed information and a map of the area closure are available at https://tinyurl.com/RRSiskiyou. Bear Camp Road is open with restrictions. The following groups will be allowed to use Bear Camp Road beginning today, September 10th, at noon: Residents of Agness and Galice, special permit holders for Rogue River trips and mining claims, and Blackbar Lodge. We appreciate the public’s patience and cooperation. Once tactical firing begins again, the road will be closed to all non-fire traffic until it is safe for the public to use. The closure area is described below. A temporary forest closure order is in effect for the area around the Klondike Fire. Forest Roads 4103, 4105, 2512, and 2402-676 remain closed. A temporary road closure order 06-10-22-1877 is also in place for Bear Camp Road between Agness and Galice. Information on current conditions can be found at the Rogue River-Siskiyou National Forest website: https://www.fs.usda.gov/alerts/rogue-siskiyou/alerts-notices. The Joint Information Center (JIC) is your "One-Stop-Shop" for important and current information on the Taylor Creek, Klondike, Natchez Fire, Miles Fire, Columbus Fire, Ramsey Canyon Fire and other major wildfires in southwest Oregon. These fires are being managed by the Rogue River Siskiyou National Forest, Umpqua National Forest, Oregon Department of Forestry, and the Bureau of Land Management. Hours: 7 a.m. to 8* p.m. daily. *Hours will be extended with increased and new fire activity. Oregon Department of Transportation (ODOT) provides real-time road closure information through their TripCheck website. For road updates in southwest Oregon, visit the ODOT Trip Check Twitter feed. U.S. Forest Service Rogue River-Siskiyou National Forest ..... Awesome Inc. theme. Powered by Blogger.